Meet Sully Mulhern, one of the latest Eagle Scouts to emerge from Troop 28. 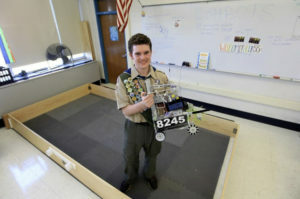 The 17-year-old senior at Cohasset High School recently decided to integrate his passion for computers and robotics into his Eagle Scout project, which he hopes will serve the school’s robotics team for years to come. That’s when Mulhern said he was inspired to solve the problem.